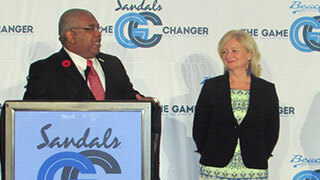 Joan Haines, Principal of Toronto-based Coastal International and Sandals Resorts’ P.R. consultant for 25+ years, has announced her retirement and the closure of her business effective 1JUN. Haines began her relationship with Sandals Resorts just after Sandals Antigua opened and even prior to the establishment of the Unique Vacations’ Canadian office. At that time, the all-inclusive product was relatively new in Canada as was the “couples only” concept. There was considerable work to be done to educate the trade, consumers and media and promotional partners on the tremendous value and vacation experience that Sandals offered. Through the years, working with the support of Gary C. Sadler and Maureen Barnes-Smith and their teams, Haines played a significant role in building the brand(s) through public relations, promotions, local advertising, and marketing communications programs from development through to implementation. She says working with Sandals has been the highlight of a long career in travel, tourism and hospitality, and that the company gave her the opportunity to do her best and most rewarding work. “One could not ask for a better client,” Haines says. Her email remains the same: joan.haines@rogers.com and she can also be reached at 416-606-1454.